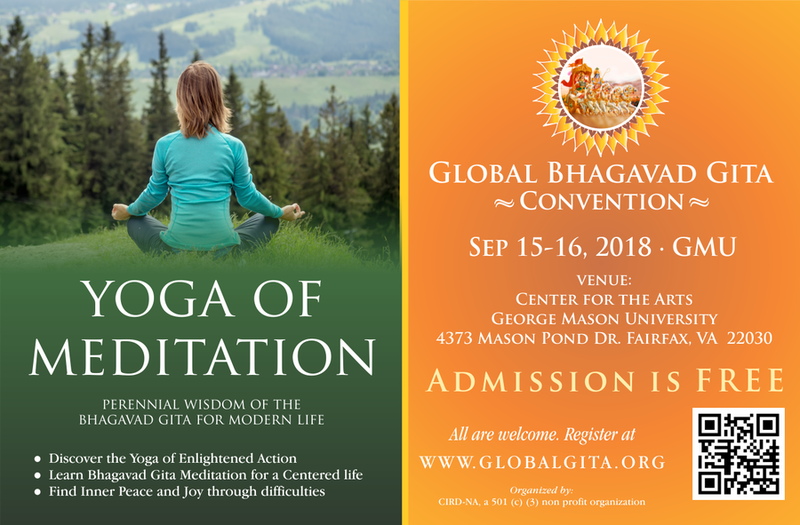 FAIRFAX, VA, September 13, 2018 — Through a series of global dialog, Center for Inner Resources Development – North America (CIRD-NA) presents the message of the Bhagavad Gita as a road-map to achieve personal and universal well being at this year's Global Bhagavad Gita Convention (GBGC). The convention will be held from September 15–16, 2018 (Saturday and Sunday), at Center for the Arts, George Mason University in Fairfax, Virginia, USA. Admission to the convention is free. Bhagavad Gita is an ancient Indian text that documents the dialog between two great warriors, Krishna, the teacher and Arjuna, the student. For the past several millennia people from all walks of life have discovered practical spiritual wisdom in the Gita to empower their lives. The convention features presentations by a distinguished group of speakers including professionals, scholars, leaders, and thinkers, who will share Gita's timeless wisdom with practical perspectives. Convention will feature cultural performances by various accomplished artists. Attendees from all walks of life will discover how the lessons of the Gita can enrich and empower their day-to-day lives. Participants will learn the relevance of Meditation to Experience True Joy and Freedom. The global dialog on Bhagavad Gita is being convened as part of a long-term effort under the inspirational guidance of Swami Bhoomananda Tirtha, a renowned Spiritual Master from India. The Keynote speech on the first day will be delivered by Swami Sarvapriyananda, Minister and Spiritual Leader of the Vedanta Society of New York. Other speakers and panelists include Swami Nirviseshananda Tirtha, Ma Gurupriya, Dr. Kavitha Chinnaiyan, Dr.Gary Weber and Professor Graham Schweig. Master of Ceremony will be Dr. Aparna Ramaswamy. Dance performances and unique chanting sessions will be the highlight of the convention. “The convention will offer a platform for learning, knowledge exchange and collaboration and will aim to positively impact personal and social welfare,” according to Pankaj Bhatia and Dr. Ravi Jandhyala, Program Convenors of 2018 GBGC. The Center for Inner Resources Development – North America (CIRD-NA) is a unique Knowledge Institution that helps individuals discover and harness their inner resources through a deeper understanding of the human mind, and develop a poised all-embracing personality. CIRD conducts workshops for corporations and executives, classes and spiritual for seekers. Swami Bhoomananda Tirtha, a renowned spiritual master and teacher of Vedanta from India for more than five decades is the inspiration and guide for CIRD. In the US, CIRD-NA centers are located in McLean, VA and in Irvine, CA.